Galfer solid-mount Front Wave rotors Patented inner and outer Wave design minimizes heat transfer, equalizes dissipation and evens out pad wear. Why go to a genuine Galfer wave rotor? After all there are other copy-cats out there that look much alike! 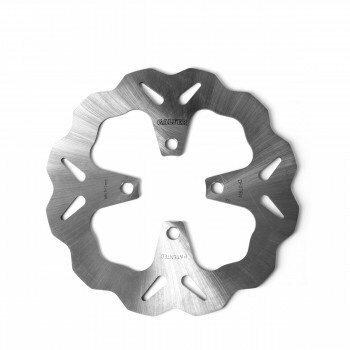 All Galfer Wave rotors are laser cut and made of a unique to Galfer high carbon 420 stainless steel material and have been pre-heat treated keeping in mind the final use of each specific application. Double disc ground to assure perfect flatness and the most efficient contact surface between pad and rotor. The end result to such extensive and expensive manufacturing process dramatically improves brake lever feel and brake feel feed back allowing the rider to get a much stronger and progressive brake performance.